Are markets holding the Fed hostage? Market volatility seems to be handcuffing the Federal Reserve. The oil and stock market's roller coaster ride this year could force the Fed to pump the brakes on its plans to raise interest rates four times this year. Increasingly, the markets are playing a bigger role in the U.S. central bank's decisions. That's odd, given that the Fed's primary goals are to foster a healthy job market and keep prices stable for goods like food and gas. Called the Fed's "dual mandate," both jobs and inflation are heading in the right direction. So that should mean that the economy is healthy enough to allow the Fed to continue to raise rates from these historically low levels. Not so, say some Fed officials. New York Fed President Bill Dudley noted earlier this week that if markets continue to remain shaky, "it could potentially lead to a more significant downgrade to my outlook." For years, the Fed's officials said they would raise interest rates when America's job market shows lots of progress and when they were "reasonably confident" inflation would move up to 2%. Well, unemployment is 4.9% -- a level many economists, even those at the Fed, consider "full employment" or a really healthy job market. The Fed considers inflation around 2% to be healthy. A lot more or less is worrisome. The Fed looks closely at a measure called personal consumption expenditure to measure inflation. It's risen for three straight months and in January it was up 1.3% from a year ago. As long as inflation is moving towards the 2% target and not away from it, it's a good sign. But while the real economy has made strong progress, stocks have been all over the place. The year began with the worst start to stocks on record. And the volatility has continued -- the Dow has moved up or down by 120 points or more five of the last seven trading days. Stock markets play a key role in the economy because they reflect financial stability. Now they increasingly seem to dictate the Fed's decisions and not just the job market and inflation as the dual mandate suggests. "It does seem over the past few meetings that unstable financial markets are playing some kind of role in the eventual policy decision," says Sam Bullard, senior economist at Wells Fargo. Bullard notes that leading up to the Fed's September meeting last year, there was a 50-50 chance of a rate hike. 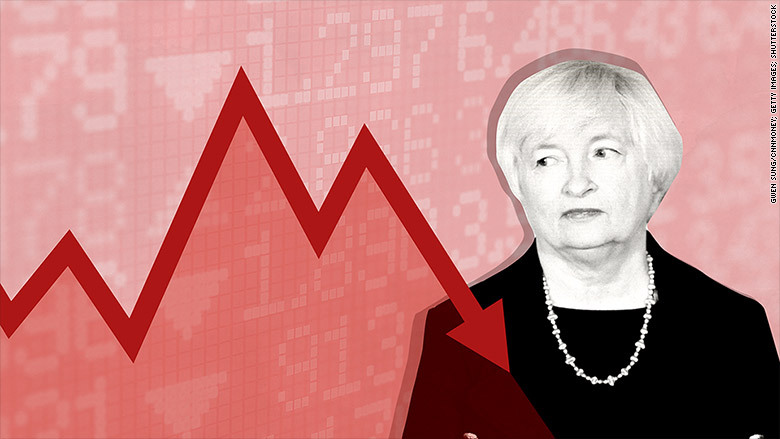 But the Fed didn't raise rates, partially because stocks fell sharply in late August. And even though Fed chair Janet Yellen has said it's not the Fed's policy to respond to "the ups and downs of the markets," the central bank admitted it did so in September, arguing that the volatility was a reflection of the gloomy global economic outlook. "In light of the developments that we have seen and the impacts on financial markets, we want to take a little bit more time," Yellen said at the time. After the Fed raised rates in December for the first time in nearly a decade, its committee predicted it would increase rates four more times in 2016. Now it looks like there's next to zero chance of a rate hike in March and markets are only putting a 38% of a rate hike in June, according to CME Group. Bottom line: the job market and inflation are clearing the path for more rate hikes. But the stock market is getting in the way.